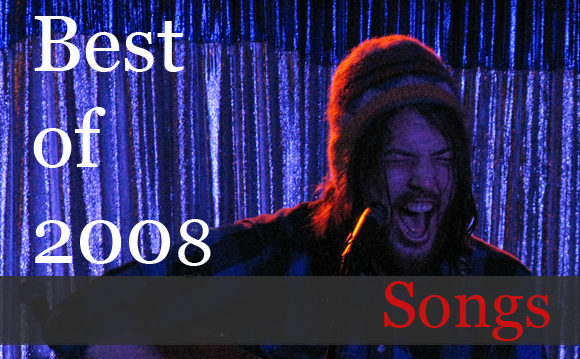 I went a slightly different direction for 2008’s songs list — there’s some crossover with yesterday’s albums list because my favorite three albums happened to have my favorite three songs of the year, but other than that I tried to spotlight 20 singles and album tracks by artists who didn’t quite stand out enough across the board to crack the albums best-of. Get your left-field on after the jump and remember, the Rawkblog pledge drive ends this weekend — please give now! Simple but elegant, “The Van Song’s” unembellished piano runs hand-in-hand with Hayden’s plaintive vocals, until he jumps an octave and the song gives way a horn solo. It feels lived-in and off-the-cuff without sacrificing craft — the combination that, when he strikes it just right, makes Hayden one of his generation’s finest folkies. You & Me was a disappointment — two-thirds great, one-third dross — but “In The New Year” speaks to all the Walkmen’s best qualities. It’s at once celebratory and funereal, a look forward even as the present crumbles around their ankles. Would that they could muster this kind of passion with every song. We built this city on rock ‘n’ roll. Bernie Taupin would be proud. The most wistful moment on In Ghost Colours, and the most affecting for it. “Run to the lights of the city / these moments passing will be there,” goes the chorus, and an album embraced by the youth begins to grow up. Robin Pecknold throws down the gauntlet and challenges Jim James to a duel — vocal cords at a dawn! — and wins. “Blue Ridge Mountains” single-handedly vindicates the Eagles’ back catalog. Or maybe America’s. The Reverend’s still got it! And Corinne finally gets a song worthy of her magnificent pipes. The year’s finest ballad. It plays with the ease of a Neruda poem and the teen nerves of Buddy Holly. Which of these things is not like the others? The good half of Empire of the Sun’s glossed-up debut hits me as hard last year as any beard-folk — this song is like Phoenix with a drug problem and a recurring role on Miami Vice. The best bit of the Wedding Present’s Albini-produced mid-life crisis treatise on barhopping and romance in Los Angeles. The catchiest damn thing I heard all year. What a hook — and earnest, too. My least favorite Girls do, yes, have a certifiable jam. The Ronettes via Beat Happening. From the Synecdoche, New York soundtrack. If only he sang on it. If this is actually a demo, I’ll eat my blog. Biting my nails until LPV. Charming and it’s about me. Indie pop represent. If Lookout Mountain, Lookout Sea is really David Berman’s last album, he went out on a high note — or several, sung by his wife and good intentions. Expert My Bloody Valentine aping tempered with just enough melodic clarity. A near-perfect slice of ’70s session-pop sunshine from an album that barely missed my top 30.